Said Djinnit, Special Envoy for the Great Lakes Region, briefs the Security Council on the situation in the Great Lakes region. 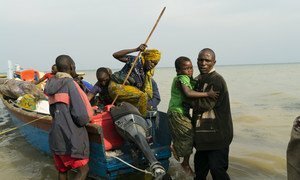 The United Nations Security Council on Tuesday called for an end to the recurring cycles of violence and instability in Africa’s Great Lakes region, as a senior UN official reported that some armed groups are continuing attacks on civilians in the Democratic Republic of the Congo. “The negative forces, including the Allied Democratic Forces, continue to attack and terrify the population, causing suffering and displacement, and fuelling mistrust between the countries of the region,” said the Special Envoy for the Great Lakes, Said Djinnit. The UN has long been engaged in efforts to bring peace and stability to the vast region, stretches across Burundi, the Democratic Republic of the Congo (DRC), Kenya, Rwanda, Tanzania and Uganda. It has been plagued by decades of political instability and armed conflicts, porous borders and humanitarian crises, as well as tensions over natural resources and other potentially destabilizing factors. A key step has been the adoption of a UN-brokered accord in February 2013 aimed at stabilizing the DRC and the region. In today’s briefing, Mr. Djinnit told the Council that while implementation of this accord, formally known as the Peace, Security and Cooperation Framework, has been slow and requires greater political will, it remains a vital tool to bring stability to the region. One of the root causes of conflict in the region is exploitation of natural resources from the DRC. “Continued illicit exploitation and trade of natural resources from the DRC contributes, as we know, to financing negative forces and deprives the country of critical sources of growth and development,” he said. He also said that in the DRC, tensions persist between the Government and the opposition despite progress in preparations for the elections. Mr. Djinnit noted that in Burundi, the political and human rights situation remains of great concern as the country heads towards a referendum for constitutional changes. Further, human rights violations and impunity remain central to the instability across the region, he added, stressing that the humanitarian situation there also requires greater attention. In a press statement issued after the briefing, the Council reaffirmed that the accord “remains an essential mechanism to achieve durable peace and stability” in the DRC and the region, and called on all signatories to fulfil their respective commitments to address the root causes of conflict and promote lasting regional development. The accord was signed by 11 countries, namely Angola, Burundi, the Central African Republic, the Republic of Congo, the DRC, Rwanda, South Africa, South Sudan, Tanzania, Uganda and Zambia. The UN, the African Union (AU), the International Conference on the Great Lakes Region (ICGLR) and the Southern African Development Community (SADC) act as guarantors of the accord. In early 2014, Kenya and Sudan became the 12th and 13th signatories of the accord, respectively.